Sergei Skripal, the 66-year-old former Russian double agent who was poisoned with a nerve agent in Britain last month, is no longer in critical condition, the medical director of Salisbury District Hospital said Friday. “He is responding well to treatment, improving rapidly and is no longer in a critical condition,” Christine Blanshard was quoted by Britain’s Press Association as saying. Skripal and his 33-year-old daughter Yulia were found unconscious on a bench in Salisbury on March 4 following exposure to Novichok, a nerve agent. Police have said the highest concentration of the nerve agent was found on the door of the Skripal home, which was sealed off. Skripal, a former colonel in Russian military intelligence, was convicted of selling Russian state secrets to Britain in 2006. He was traded to Britain in a high-profile spy swap four years later. Britain has maintained that Russia was responsible for the nerve agent attack – something Russia has denied. Blanshard also offered an update on the condition of Skripal’s daughter, who on Thursday issued a statement that her “strength is growing daily” as she recovers from the poisoning. 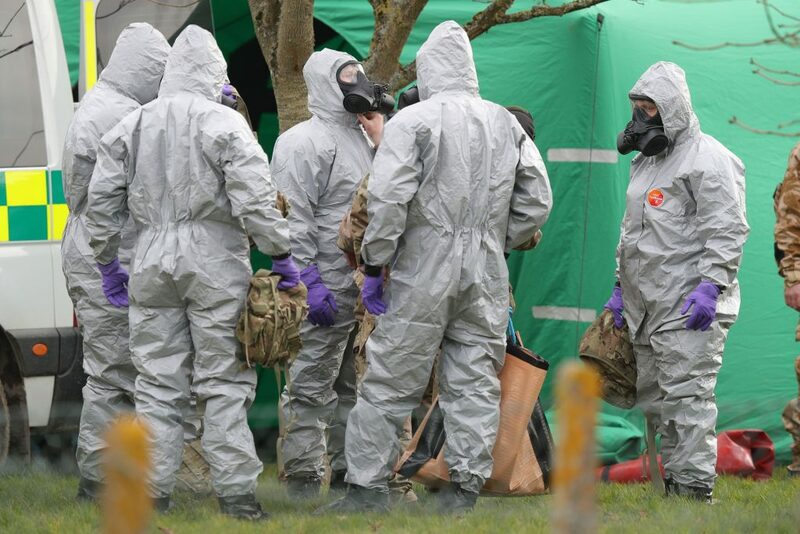 Earlier Friday, media attention focused on three other lives affected by the nerve agent attack: two dead guinea pigs and a cat found in Skripal’s home in south-western England. The residence had been sealed off for investigations. The cat was found in a “distressed state” and was euthanized “to alleviate its suffering,” a spokeswoman from Britain’s Department for Environment, Food and Rural Affairs said, according to PA. The Russian Foreign Ministry noted the animals could have been an important piece of evidence, according to state news agency TASS. “Is this Britain’s usual way of treating house pets? Is it quite common?” ministry spokeswoman Maria Zakharova posted on Facebook, about the cat, according to TASS. Zakharova cited Russian sources in saying that the British Broadcasting Corporation (the BBC) knew that the pets were kept in Skripal’s house. “We would like to hear explanations,” she added. Friday also saw Russia and Britain exchange accusations over the source of the nerve agent used in the attack on the Skripals. According to a Friday report from the Times of London, the agent came from a Russian military research base in Shikhany, around 800 kilometres south-east of Moscow in Russia’s Saratov region. Chemical weapons expert Hamish de Bretton-Gordon told the newspaper that intelligence information he had seen clearly pointed to the Shikhany facility. The quantities of the Novichok chemical weapon stored there are sufficient for attacks, but too small for military operations, according to Bretton-Gordon. Bretton-Gordon added there was no evidence that the nerve agent came from other laboratories in the former Soviet Union, such as Ukraine or Uzbekistan. Russian Foreign Minister Sergei Lavrov rejected the report’s suggestion of Russian culpability. “If they learned about some enterprise in the Saratov region last month or just yesterday, that shows once again that they are desperately trying every day to find some new confirmation of their totally hopeless stance,” Lavrov said, according to TASS. Nikolai Pankov, a national lawmaker from the Saratov region, told TASS that no nerve agents had been stored in Shikhany.